GUEST POST BY DELLA HANSMANN. Read more of her thoughts on green building and design at Dwelling Places. Does anyone else in their late twenties (or with kids that age) remember the old Sesame Street song about “Clean, clear water”? I still find myself singing “Don’t… waste… water. 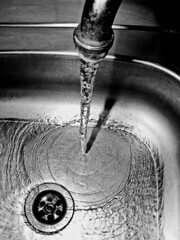 Water water water!” when I turn on the faucet. 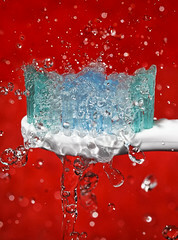 The typical US household uses 293 gallons of water per day. For comparison’s sake, the typical African home uses just five. I’m not suggesting we should all limit ourselves to 5 gallons per day (per household) but surely there is a middle ground. Water is a precious commodity that we tend to take for granted. Although 70 percent of our planet is covered in blue on a satellite image, most of that water is salty. Of the one percent of that water that isn’t in the oceans or locked in (rapidly melting) polar ice caps, half of that is polluted. We might want to start thinking about water as a valuable resource rather than a something we thoughtlessly let run down the drains. Although we aren’t in a drought prone area like California or baking away in the great southwester desert the Midwest does need to pay more attention to water use issues. Groundwater depletion is a real problem in this area. When more water is pulled up out of the ground than is naturally draining down into it the water table begins to drop making it harder for people to get water from the ground. The most shallowly drilled wells dry up. Less water runs into streams and lakes. And the overall quality of the ground water is reduced. In Waukesha, WI demand for water is greatly exceeding the available ground water. The water table has been dropping rapidly since the 1980s and is now 600 feet lower than its original level. City officials are now considering sourcing their water from Lake Michigan but the transition will not be easy or cheap. Flush toilets consume 40 percent of water in the average house (toilets installed before 1980 can use up to 6 gallons per flush). (Just one more reason a toilet can be disgusting, folks). Modern standard toilets still use 3.5 gallons so a low flow toilet (using 1.6) is a big improvement. Dual flush toilets use less water for some flushes than others – I’ll let you figure out why. Low Flow shower heads and faucets are in expensive and easy to install (pick one up at the local Menards or Home Depot and DIY your way to better water usage and maybe even a fancy multi-option spray head. Low flow shower heads don’t reduce the water pressure so you likely won’t even feel the difference. While you save as much as 2.5 gallons a minute on your shower routine. Tankless or On Demand water heaters are a great answer to long runs of un-insulated piping, waiting while the hot water works its way up to the second floor (and wasting good clean cold water while you do) and letting water you’ve paid to heat sit around dissipating warmth into your basement all day. Basically just a small box mounted to the wall somewhere in your bathroom, it switches on only when you need it. We all need fresh clean water to stay healthy happy. Help save it today! What about washing clothes? I was horrified when I moved to the US and found out how much water is used to wash clothes in the top loaders and it isn’t made any easier by the propensity of people to change clothes every day. Do the sniff test – if it doesn’t smell of sweat and you haven’t worn it all week then wear it again – okay I exaggerate but a pair of jeans can be worn for three days and believe it or not you won’t come down with some dreaded disease. Whilst living in the US we used only a fraction of the amount of water the average household uses, okay there was only two of us but we used about a fifth of the normal water usage, part of it was being sensible with the sprinklers, twice a week at night was more than enough to keep our lawn green in semi-arid desert (it was rented so no choice about having a lawn) and part of it was having a front loader machine but where else does it all go? I have to agree with you, Joanna. Out on our land, where we don’t have a source of water except the pond and snow melt, I have had a chance to experience water and its value on a different scale. There are some non-renewable resources that we in the U.S. are not paying even close to the accurate price right now, and it makes us unforgivably sloppy.